Tracking The Origins Of Haiti's Cholera Strain : Shots - Health News Scientists investigating the origin of the Haiti cholera strain say it's possible the strain will be one that's never been seen before. Where Did Haiti's Cholera Come From? Scientists with the US Centers for Disease Control and Prevention have Haitian cholera bacteria under their microscopes, and are looking for molecular "fingerprints" that might tell them where the bug came from. Dr. Eric Mintz, the CDC's chief detective for diarrheal diseases, says he isn't sure of the answer yet. Mintz, who's in Haiti, tells Shots the lab tests may show "a strain that has been very commonly seen before. 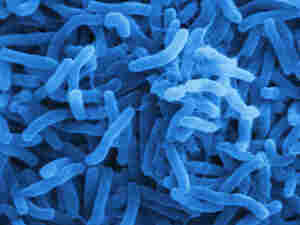 In that instance, we won't be much further along in understanding the origin of the cholera strain here in Haiti." Or, Mintz says, "it's possible we will see a strain we've never seen before." As of Friday, Haitian officials had counted 4,700 cases of cholera and 330 deaths. Mintz says about 6 percent of victims have died, but public health officials hope to reduce that fatality rate to 1 percent or less. The origins of the strain became a hot issue in Haiti this week after the mayor of Mirebalais, a town in the middle of the outbreak, suggested that Nepalese soldiers brought it from their homeland to a nearby United Nations peacekeeping camp. On Friday hundreds of protesters marched on the UN camp demanding that peacekeeping forces leave Haiti. There were outbreaks of cholera in Nepal last summer, but UN officials say there's been no evidence of cholera in the camp. CDC laboratory work so far has established that the Haitian cholera strain is one that's been identified in Latin America, Asia and Africa. Mintz says it may be impossible to determine exactly where the Haitian strain came from. But "if a strain of cholera was [already] here, it would have caused an explosive epidemic" before now, Mintz says. "Likely it came from somewhere else." Mintz says it may never be known where the Haitian strain came from. But John Mekalanos, chairman of microbiology and molecular genetics at Harvard Medical School, disagrees. He and other Harvard researchers plan to get a much more fine-grained picture of the Haitian strain, down to its genetic sequence. Mekalanos says he has "no doubt" that detailed genetic analysis will reveal "with some certainty" whether the Haitian strain was introduced from somewhere else -- and most likely, where. First, the Harvard scientists have to get it. But then it should take only a couple of weeks to sequence the Haitian strain, and get closer to solving the mystery.